? USB RECHARGEABLE WITH LONG RUN TIME - Stop Wasting Your Money and Never Buy Batteries Again. The Gator 320 bicycle head light charges from your computer or any device with a USB port. This rechargeable headlight only takes 2 hours to fully charge. It has 4 modes: High (2hr runtime), Mid (4hr runtime), Low (6hr runtime), and Flashing (5hr runtime).
? INCREDIBLY BRIGHT TO KEEP YOU SAFE - FREE TAIL LIGHT INCLUDED FOR A LIMITED TIME! 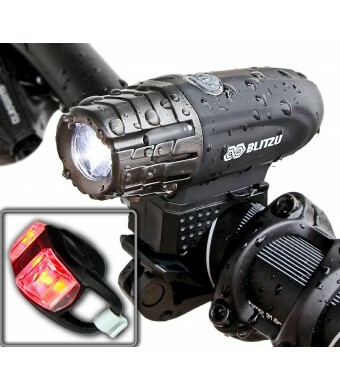 Instantly improve your visibility & safety with our powerful LED bike light. You will be shocked and amazed at how bright it is! The Gator 320 Bicycle headlight equips with the latest CREE LED that provides Ultra Bright 320-lumen output and up to 300 feet beam length.
? 360 DEGREE SWIVEL ABILITY AND INDESTRUCTIBLY BUILT - Practical, Reliable, and Durable. Rotate it to shine literally any direction you want, mount and detach in just seconds without tools! This Front Bicycle Light Constructed with Military Grade Anodized Finish. Drop-tested from 2 meter, impact resistant and built to perform. Water resistant rated to IPX5 - Protected against splashing water from any angle.
? 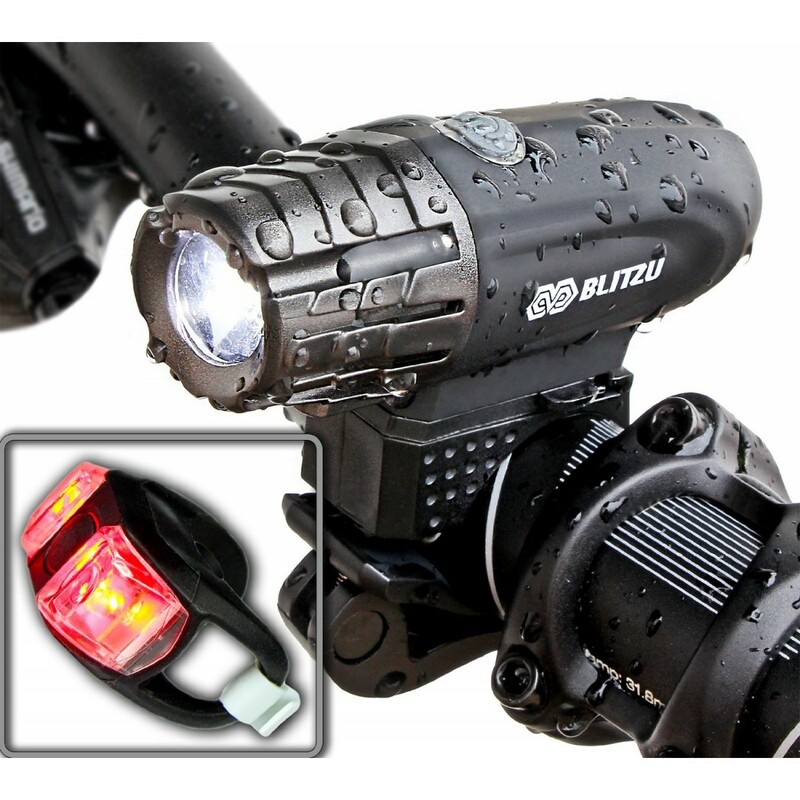 UNIVERSAL FITMENT FOR ALL KIND OF BIKES - The Blitzu Gator 320 Bicycle front headlight fits handlebars up to 40 mm in diameter including TREK, SALSA, JAMIS, SPECIALIZED, GIANT, DIAMONDBACK, SCHWINN, CANNONDALE, GT, SCOTT, MONGOOSE and more.
? ORDER NOW WITH NO RISK! 100% SATISFACTION GUARANTEE - We are so confident you will love the Gator 320 bike light that we offer 30 days Money Back Guarantee with one year warranty! All in one design bicycle light - Super bright 320 lumen output bicycle front light led - 360 degree swivel ability - No wires or external - Water resistant IPX-5 rating, weather tight design ensures all condition use - Can be used as a mountain bike headlight, road bike lights, kid's bike safety light and More! USB Rechargeable - Charges from your computer or any device with a USB port. Buy from JKL Innovation for your 100% SATISFACTION GUARANTEE! This guarantee applies only to products purchased by the end-user from the manufacturer - JKL Innovation. Purchases made through other sellers are not warranted by the manufacturer. Bike Safety Light - Emergency Bike lights Rechargeable and Safety Bike Light .